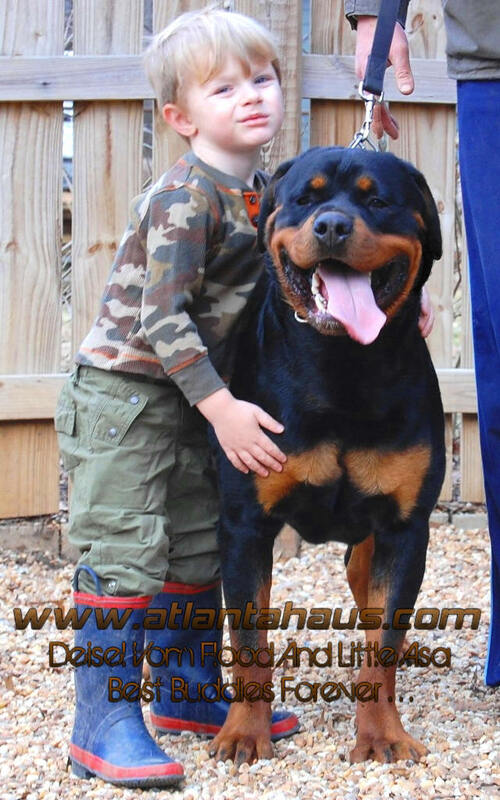 Atlantahaus Rottweilers is a specialty Rottweiler breeder in Atlanta, Georgia. We are second generation world class German rottweiler kennel, and take an enormous amount of pride in the working temperment and exceptional socialization of our rottweiler puppies for sale. We are a code of ethics breeder, and as such we do require that only females with correct temperments be used in any proposed rottweiler breeding to our German rottweiler studs. We also require that any proposed breeding pair be composed of males and females that have the correct intellectual capacity and traits that make up the proper rottweiler temperment. Diesel Vom Flood and Little Asa - Best Buddies Forever! The Rottweiler is powerful, calm, trainable, courageous, and devoted to their owner and family. Loyal and protective, they will defend their family fiercely if needed, seemingly immune to pain. Serious, even-tempered, brave, confident and courageous, this breed needs an owner who is strong minded, calm, but firm and able to handle their massive size. A docile, natural guard dog with a laid-back, reliable temperament. They are highly intelligent and have proven their worth beyond question in police, military, and customs work over many centuries and can be trained for competitive obedience. Because of their size, training should begin when the dog is a small puppy. This breed needs a lot of leadership and socialization. They will not be happy confined to a kennel or backyard. The objective in training this dog is to achieve a pack leader status. It is a natural instinct for a dog to have an order in their pack. When we humans live with dogs, we become their pack. The entire pack cooperates under a single leader. Lines are clearly defined and rules are set. You and all other humans MUST be higher up in the order than the dog. That is the only way your relationship can be a success. When the Rottweiler receives consistent leadership and is trained, it will be a good playmate for the children. It will accept cats, other dogs, and other household pets, as long as the dog has been socialized well and has owners who assert their authority over the dog. Friends and relatives of the family are normally enthusiastically welcomed. Strangers to whom the dog senses bad intentions from can get no further than the sidewalk. Keeping these natural rottweiler character traits in mind when planning a breeding pairing is the best hope for the German rottweiler breeder. The reason for this is that when bred correctly, German rottweilers are unmatched in intelligence, courage, loyalty, and love for their family. Once you have owned a true German rottweiler puppy from a Rottweiler breeder whose focus is to breed in such a way that these traits are the main emphasis, you will never want to own another breed! This entry was posted in Rottweiler Puppies, Rottweiler Puppy. Bookmark the permalink.